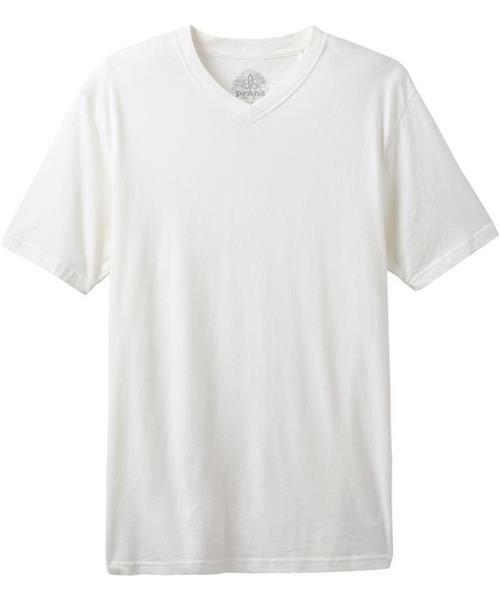 The prAna V-neck t-shirt is a lightweight basic for everyday wear when it's warm and a base layer as it cools. This Fair Trade™ certified tee is cut for a standard fit. prAna V-Neck SS - Mens is rated 4.5 out of 5 by 2. Rated 5 out of 5 by Hikingthenorth from Great fit! I bought two of these shirts and I love them. They are holding up great, the material feels nice, and they are finally long enough that it doesn't look like a belly shirt. I'm 6'1'' and general have issues with shirt length. Prana makes the perfect fit. Rated 4 out of 5 by Gibsonsguy from Prana Men's V-neck shirt quality shirt in organic cotton. Good fit and construction.